Click for a closer view of Kayla’s collection. On some browsers, you may have to click again after the first time the page reloads. Jackie: You have two copies of Birth by Sleep. One copy is the normal US edition, while the other is the US Target/Wal-mart edition. How did you come across owning both of them? Kayla: When I figured out that Birth by Sleep was close to its release date for the US I decided to go ahead and pre-order it when I had the chance. Once I received the game I noticed it came with two different covers. The one you see with the 3D characters is actually a protective sleeve for the normal case. (: So I didn’t actually buy two Birth by Sleep games. Jackie: Oh, I see! That’s a great way to own two pieces of cover art. 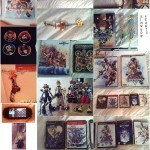 I see that you have the PlayArt figures…mostly of Sora. Is he your favorite character? Kayla: Yes, Sora is indeed my favorite character. I really love his personality and how cheerful he can be. He’s been my fave since Kingdom Hearts was released. Jackie: Which game ending was the most memorable for you? Kayla: I’d have to say the Kingdom Hearts 2 ending. It’s hard to describe in words but that ending made me burst into tears. Haha. Jackie: It was the same for me too! After all you go through, I think that’s as perfect an ending as you can get. You answered that you would take your t-shirt with you if you were stranded on an island. What’s special about the t-shirt that singles it out from your collection? Kayla: Well, I picked the t-shirt since it would keep me warm at night. That is if it were cold. haha. It was really hard to pick just one thing, so I decided to go with something more durable. Is there one item out of those that you have a particularly special attachment to? If so, why? Kayla: I would have to say my Kingdom Hearts 1 game. I got it in 2002 for Christmas. I’ve been attached to the Kingdom Hearts fandom since I got that game, so it’s special.